Douglas Brinkley has 1 media appearance. Douglas Brinkley discusses The Majic Bus: An American Odyssey. Join us this evening for author Kabir Sehgal in conversation with Douglas Brinkley, discussing his newest book, Coined. Sehgal, an insider, casts aside our workaday assumptions about money and takes the reader on a global quest to understand the relationship between money and humankind... not only a profoundly informative discussion of the concept of money, but it is also an endlessly fascinationg take on the nature of humanity and the inner workings of the mind. Kabir Sehgal is a Vice President in emerging market equities at J.P. Morgan in New York. He serves as an officer in teh United States Navy reserve, served as a speechwriter on a presidential campaign, and is a term member of the Council on Foreign Relations. He is a New York Times bestselling author, and books include Walk in My Shoes with Andrew J. Young, A Bucket of Blessings, and Jazzocracy. He's a Latin Grammy-nominated producer and has perfomed with Grammy-award winning musicians as a jazz bassist. Kabir is a graduate of Dartmouth College and the London School of Economics. Douglas Brinkley is a professor of history at Rice University, CBS News Historian, and a contributing editor at Vanity Fair. The Chicago Tribune has dubbed him "America's new past master." Seven of his books have been selected as New York Times Notable Books of the Year. Cronkite won the Sperber Prize for Best Book in Journalism and was a Washington Post Notable Book of the Year 2012. The Great Deluge won the Robert F. Kennedy Book Award. He lives in Texas with his wife and three children. Brinkley has been awarded honorary doctorates from Trinity College (Connecticut), University of Maine, Hofstra University, and Allegheny College, among many others. Can't make it to the event? You can order a signed, personalized copy of this book. We ship worldwide. Simply write "SIGNED COPY" and the name for the personalizations in the Comments field during checkout. Thank you for supporting Kabir Sehgal, Douglas Brinkley and your local independent bookstore! President Nixon's voice-activated taping system captured every word spoken in the Oval Office, Cabinet Room, and other key locations in the White House, and at Camp David -- 3,700 hours of recordings between 1971 and 1973. Yet less than 5 percent of those conversations have ever been transcribed and published. Now, thanks to professor Luke Nichter's massive effort to digitize and transcribe the tapes, the world can finally read an unprecedented account of one of the most important and controversial presidencies in U.S. history. For the first time, President Richard Nixon is revealed uncensored, unfiltered, and in his own words. Luke A. Nichter is an Associate Professor of History at Texas A&M University – Central Texas, and a noted expert on The Nixon Tapes. Luke is a former founding Executive Producer of C-SPAN's "American History TV" (seen in 41 million homes) and his work is periodically reported on by the New York Times, Washington Post, and the Associated Press. His website, nixontapes.org, offers free access to all 3,000 hours of publicly released Nixon tapes as a public service. In order to have anything signed at a BookPeople event, a copy of the event book must be purchased from BookPeople. If you purchase your book from BookPeople in advance of the event, please save your receipt and present it at the event. Thank you for supporting Douglas Brinkley, Luke Nichter & your local independent bookstore! Eric Jay Dolin is the author of the bestselling Leviathan: The History of Whaling In America, which was chosen as one of the best nonfiction books of 2007 by The Los Angeles Times, The Boston Globe, and The Providence Journal. Leviathan also won the 2007 John Lyman Award for U. S. Maritime History, and the 23rd Annual L. Byrne Waterman Award, given by the New Bedford Whaling Museum, for outstanding contributions to whaling research and history. His last book, Fur, Fortune, and Empire: The Epic History of the Fur Trade in America, was chosen by New West, The Seattle Times, and the Rocky Mountain Land Library as one of the best nonfiction books of 2010, and it also won the 2011 James P. Hanlan Book Award, given by the New England Historical Association. A graduate of Brown, Yale, and MIT, where he received his Ph.D. in environmental policy, he lives in Marblehead, Massachusetts, with his wife and two children. Professor of history at Rice University and New York Times bestselling author, Douglas Brinkley will be at Warwick's on Friday, July 27th at 7:30pm to discuss and sign his newest book Cronkite. Reserved seating is available, please contact the Warwick's book dept. at (858) 454-0347 for more information. Brinkley traces Cronkite's story from his roots in Missouri and Texas through the Great Depression, during which he began his career, to World War II, when he gained notice reporting with Allied troops from North Africa, D-day, and the Battle of the Bulge. In 1950, Edward R. Murrow recruited him to work for CBS, where he covered presidential elections, the space program, Vietnam, and the first televised broadcasts of the Olympic Games, as both a reporter and later as an anchor for the evening news. Cronkite was also witness to--and the nation's voice for--many of the most profound moments in modern American history, including the Kennedy assassination, Apollos 11 and 13, Watergate, the Vietnam War, and the Iran hostage crisis. Award-Winning Author Douglas Brinkley Reading and Signing Cronkite. The speaking portion of this event is free and open to the public. Wristbands are required to join the signing line at this event and are available only with the purchase of a copy of Cronkite from BookPeople. We will begin distributing wristbands for the signing at 5pm on the day of the event. 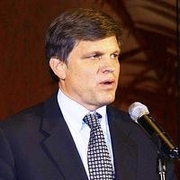 Douglas Brinkley is a professor of history at Rice University and a contributing editor at Vanity Fair. The Chicago Tribune has dubbed him "America's new past master." Six of his books have been selected as New York Times Notable Books of the Year. His most recent book, The Great Deluge, won the Robert F. Kennedy Book Award. He currently lives in Texas. Thank you for supporting Douglas Brinkley, edibleAustin, and your local independent bookstore! Venue: Maryville University Auditorium | Douglas Brinkley presents the definitive, revealing biography of an American legend: renowned news anchor Walter Cronkite. An acclaimed author and historian, Brinkley has drawn upon recently disclosed letters, diaries, and other artifacts at the recently opened Cronkite Archive to bring detail and depth to this deeply personal portrait. He has also interviewed nearly 200 of Cronkite's closest friends and colleagues, including Andy Rooney, Barbara Walters, Dan Rather, Katie Couric, Bob Schieffer, Jimmy Buffett, and many more. For many, the voice of CBS news anchor Walter Cronkite is inseparable from momentous historical events including the assassination of JFK, the Vietnam War, and the early Apollo missions. Brinkley, author of The Great Deluge, Wilderness Warrior, and other works of history and biography, has thoroughly explored the Cronkite Archive and interviewed hundreds of the newsman’s colleagues and friends for this multi-faceted portrait. Chris Matthews is the host of MSNBC’s Hardball and NBC’s The Chris Matthews Show. His bestselling books include Hardball, Kennedy & Nixon, Now, Let Me Tell You What I Really Think, and American: Beyond our Grandest Notions. Douglas Brinkley is currently considered a "single author." If one or more works are by a distinct, homonymous authors, go ahead and split the author. Douglas Brinkley is composed of 4 names. You can examine and separate out names.